Today, in 1954, Cynthia Morris Sherman was born in Glen Ridge, New Jersey. And although she would go on to adopt many personas and guises, she would be known to the world as Cindy Sherman. Today, Cindy Sherman celebrates her 63rd birthday. We celebrate all things Sherman. However, by the time Sherman reached college, she was no longer wearing make-up, bras or shaving her legs, for that matter. Sherman attend college in Buffalo, New York. She studied photography and failed her first exam. Outside of the classroom Sherman was her won subject. Her wardrobe was full of eccentric fancy dress. Sherman would attend parties in her get-ups. If she was depressed, she would lock herself away in her room, playing with make-up and characters. Her major breakthrough came with the Untitled Film Stills series, a collection of black and white photographs of herself wearing costumes and make-up. Sherman found inspiration in the Hollywood films of her childhood and their female stereotypes. Sherman switched to color photography in the 1980s and still uses herself as a model to show the world how gender is stereotyped. 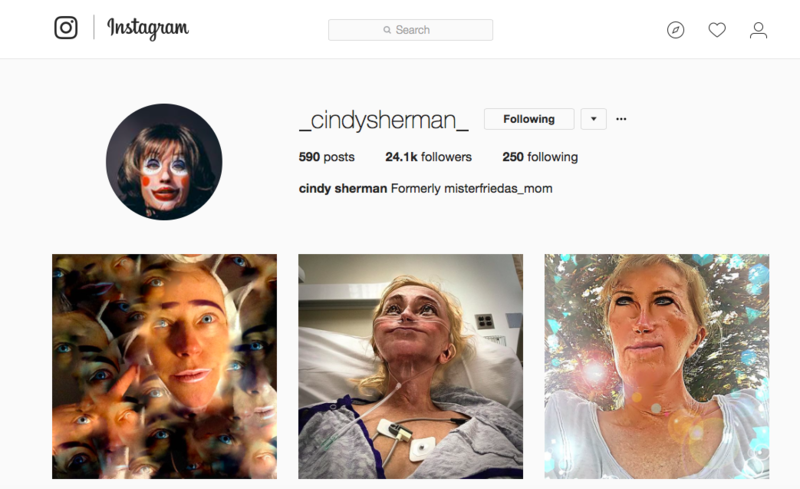 In 2016, Cindy Sherman teamed up with Harper's Bazaar to poke fun out of the Insta-famous. The series of satrical portraits, which Sherman nicknamed Project Twirl, has been inspired by the notion of social media validation. Just last year, Sherman made her own Instagram account public, an unlikely move for Sherman, who is camera shy outside of her work. The account features both personal photographs as well as images that bear a resemblance to Sherman's artistic work.